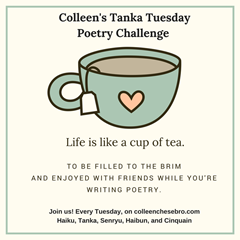 This entry was posted in Challenges and tagged #1 Best Selling Author Annette Rochelle Aben, Annette Rochelle Aben Communicates, Challenges, Colleen Chesebro, Colleen'w Weekly Tanka Tuesday Poetry Prompt, humor, poetry, she of many talents, Spring & Sing, synonyms only, tanka. Bookmark the permalink. Woo hoo! Just throw money! Thanks Sis! ❤ I am convinced that we have the music IN US!